Strawberry Milkshake Buttercream Recipe and Guide. 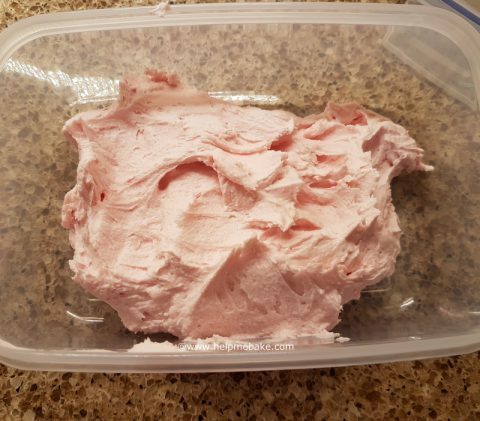 Here is the recipe and guide on how to make make strawberry milkshake buttercream. This recipe will allow you to fill a 7 inch round cake, or around 6-8 cupcakes depending on how much of the buttercream you use. You may wish to double up the recipe if you are trying to cover and fill the cake with the strawberry buttercream. Tip:- Remove the butter from the fridge 30 minutes before making this buttercream in order for the butter to soften. Then add an additional ½ Teaspoon of Milk to the mix. 1. Cut the butter into cubes and place in a mixing bowl.2. Use an electric whisk on a medium speed and soften the butter further for 1-2 minutes.3. Sieve in the icing sugar in stages and mix together using a wooden spoon. This will help bind the butter and icing sugar together easier. Once you have added all the icing sugar in then use the electric whisk to fluff the mixture and combine and smooth it further. Do this for a couple of minutes.4. Pour in the Nesquik Strawberry Milkshake powder and whisk in, you should now see the mixture turn pink in colour.5. Now add the Tablespoon of milk to the batch and continue to combine using the electric whisk, the mixture will soften slightly more and become more soft and fluffy in texture.6. I then added an additional ½ Teaspoon of milk to get the buttercream to the correct consistency.7. You can now either fill your cake or cupcakes by scraping the bowl down with a spatula and spreading on your cake or you could place it in the fridge. In the event you place the buttercream in the fridge please ensure you allow it to return to room temperature before use and re whisk it to ensure it is fluffy and airy. Tip – If you find your buttercream to be too stiff add a little extra milk to the recipe, if your mixture is too runny then add a little extra icing sugar to the mix to stiffen it up. NextNextTips on using chocolate in silicone moulds.